Wanda E. Brunstetter is a very popular author in the Christian market, particularly when it comes to Amish and historical fiction, but I'm afraid I just don't see the appeal. This is the third book of hers that I've read and I must be missing something because I simply find her plots predictable and her characters one-dimensional. I feel like I'm being cruel, but there was very little that pulled me into this story and made me want to keep reading. I enjoyed learning about the canal and Kelly's painting, particularly the details of how she made her own watercolours. A few reviewers have commented that the canal descriptions were a bit confusing, and I suppose that if you weren't familiar with canals then they might be. I grew up very close to a town which still has canal boats on it today, and the good old British children's TV show "Rosie and Jim" also proved to be very educational on this subject, so I may not be your average reader. That said, aside from the inclusion of Kelly's hobby and occupation as mule-driver, there was very little that I felt was truly original about this book. Yes, I enjoy traditional romances, but this one felt rather flat. There were a few occasions where I really felt I was starting to care about Kelly and Mike, but their conflicts never rang true. 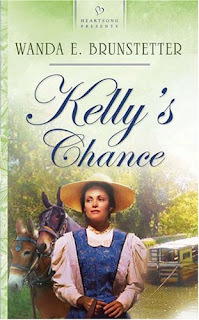 Kelly finally decided to let go of her preconceived ideas about men and marriage, but this was all very sudden at the end of the book, and it was never explained why she let go of them. Mike conveniently forgot why Kelly was hurt by her father, causing a Big Misunderstanding and argument between them, which was then cleared up about ten pages later. Their slow-moving romance seemed to culminate in a big explosion about twenty pages before the end of the book, and then everyone ever so conveniently got over their problems and lived happily ever after. It just seemed rather unbelievable. Not to mention that Kelly's distrust of men and marriage was never really explained, just vaguely related to her issues with her father. Yes, we are told that she doesn't want to marry someone just to get away from her father - but where's the shame in marrying someone for love, and happening to get away from her father at the same time? And while for the majority of the book Kelly insists that she wants to earn money so she can leave the canal boat, about two-thirds into the book she suddenly changes and says that she wants to use the money to open an art gallery. This seems to come completely out of nowhere, and seems a bit unrealistic for the time. And the epilogue was just ridiculously perfect, especially with Betsy and Kelly finally getting along and her father starting to turn to Christ. It felt unnecessary to try to wrap up every conflict in the book. Oh, and not to forgot the very unrealistic references to the Bible and God. I do enjoy the inclusion of everyday Christian values in my books, but nobody goes around quoting scripture, down to the verse and chapter, the way that these characters did. It all felt very forced, even to an avid reader of Christian fiction, almost as if the author was including verses in order to make the book more Christian. I really did try to like this book, and while I enjoyed some of the historical details and the occasional cute snippets of Kelly and Mike's relationship, I can't say that I'll be able to remember much about this book in the days to come. I'll probably pass this on to my pastor's thirteen year old daughter, but I don't think I'll be recommending it to any of my friends. I chose to read this book as part of the August selections for the Fans of Amish Fiction book club on GoodReads. September: What else have I been reading? August: What else have I been reading?